I reached a point in my sailing where it was time to sail off into the deep ocean. Coincidentally, this happened to be the point in my career when the job I loved and was building into something special was scheduled to be pulled from under me for no fault of my own. My sailing plans demanded a boat with ocean competence; my employment prospects meant it had to be cheap. The east coast at that time in the mid 1980s was full of ferro cement boats and I knew many people who built and sailed them. I had no reason to be put off by ferro. For my purposes it was as ideal as any building material could be. At the end of the year before I planned to resign I saw a 32foot double ended cutter advertised in Oban on the west coast of Scotland. I put a circle around it but then ignored it. In early spring, now feeling time’s pressures if I was to leave work in May, I knew that all those classic GRP offshore boats advertised in PBO and YM were too expensive. The concrete cutter had pushed its way up my PBO listing. Then its price plummeted. Of course it did. These were the Thatcher years, when the national economy nose-dived and in Scotland and the northern regions economic growth went underground. Oban, in the Highlands of Scotland, was a very economically depressed region. Selling a boat in Oban was pie in the sky. The owners were giving their boat one more shot at a bargain price before shipping it down to the green pastures of southern England, where no one had told them ferro boats are anathema to those who sail on the Solent. Petronella was a C-Mist 32, designed by Samson Marine of Canada and built around the world by amateurs who could afford the plans but not much more. A few were hand crafted in GRP. Many were ferro cement. A 32 foot hull is on the edge of what can be built in ferro or steel. Smaller than that and they are too heavy for their length. A concrete boat is cheap to build compared to other materials. It is a one-off. It doesn’t need the mass production that makes GRP moulds worth making in the first place. It doesn’t need the skills that wooden boats demand. Or steel. It takes about a year of long evenings to put the steel cage of the hull together, with its high tensile steel rods and its twisted chicken wire. All the through-holes must be envisaged in advance. Then it takes one day to plaster because plastering has to be done in one day to avoid a connective joint that may not have the strength of the main hull. A team of skilled plasterers is needed, the only real skill involved in the building by this stage. And then the fitting out is like any other boat except perhaps that the builder has been suckered into thinking that he/she can build a bigger boat in ferro because it is cheaper than GRP or wood. Wrong. Two thirds of a boat’s cost is in the fitting out. A cheap hull does little to reduce the overall costs. And that is why the 1960s to 1990s were a time when unfinished ferro hulls rotted in the front gardens of optimists. LOA on deck 9.9m 32'2"
The boat was called Petronella after a Scottish country dance. She had been built mainly by a wood and metal work teacher in Oban. It had been the centre of his life for several years, until it was finished enough to be taken on the water, when he discovered his wife was dying of leukaemia and both sailing and Petronella were distractions too many. He left many jobs on the boat unfinished but what he had built was strong and good and I was happy to complete his work. He had loved this boat and so did I.
Petronella was transported by road to Maldon, Essex and launched at Downs Road Boatyard, home of several ferro boats including one owned by cartoonist Mike Peyton. I worked hard for two months to make Petronella more fit for life at sea before taking her across the Thames towards the Western Approaches and the Azores. An ocean crossing lay ahead. What a dream. How dreams can go wrong. I spent a week in Ramsgate fitting my second self steering and a week in Brighton because I had to return to London and work. Petronella and I limped down towards Plymouth where a friend joined me to crew to Spain. Somewhere south of Ushant he managed to get through my defences and convince me he was dying and that it wasn’t just another bad bout of seasickness, like his other near deaths that had made me put into the Fal and Helford rivers, so we put into southern Brittany. My crew left, I singlehanded down the coast to La Rochelle and decided against Spain and the Azores. I had a wonderful summer. Petronella was an ocean capable boat but all I did for the next few years was sail the North Sea, the English channel, round Ushant to Brittany and Spain and back. I did, though, work her up to be more competent. I changed the 16hp noisy single cylinder engine for a battered two cylinder 20hp that was smoother and quieter. I put on my third self steering, a Monitor, and at last had reliable self steering. I got rid of my RDF and Decca, bought a GPS and sextant. I got a bigger dinghy, a life raft, EPIRB, new VHF, fitted extra water tanks and a small solar panel. I bought new sails. After trying white and black and then the battleship grey they made when mixed I painted the topsides a pretty green. Then I talked the talk of making an Atlantic crossing, got crew lined up almost by accident, and as 1994 turned from spring to summer I picked up the pace, which included making a new rudder in a friend’s workshop when I realised the old one was split. It’s all there in Your First Atlantic Crossing. 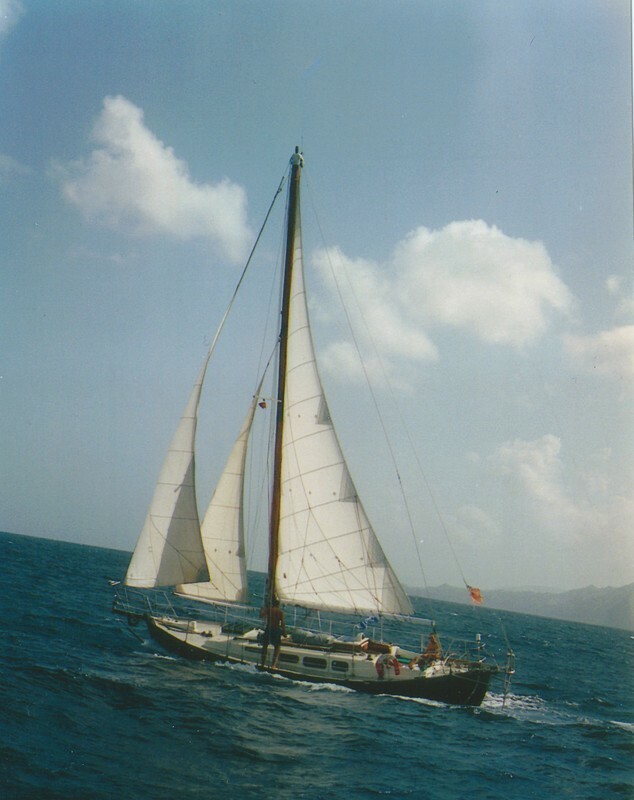 My funny little double-ender, ferro-cement, home-built, long-keeled cutter opened the door to the rest of my sailing life.